There is happening in Eger. Even when you think there is nothing. Bathe. Cycling. Hikes. Exciting activities. Festivals. Culture. Sport. You can find it all in Eger, choose yours! Eger is an elegant bath town. In the innercity there is a bath having a civilian atmosphere opened its gates in 1932. It is worth finding the Turkish bath from the 16-th century with thermal water where they offer wellness services and unbelievebly good hammam massage! In Eger you have the opportunity to bike along the bike road and discover the whole city this way.. Have a ride and if you feel like it, bike further to the Bükk mountains! At busy roads there are separated bike roads so even the small ones can enjoy it safe! The most interesting part of the road is near Dobó square where you can bike really on the coast of Eger-stream. We recomment to try it! Eger is a perfect location. The hills around are calling to discover them! Watwerfalls, caves and hills with nice panorama. Hiking for beginners and pros, on foot or by bike. Jeeptour, caveing or paraglideing? 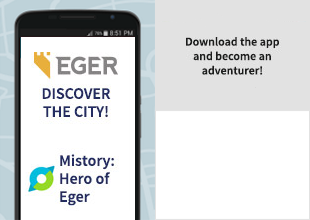 Choose as you feel like, in Eger many adventure awaits! As the bad weather passes the festival season starts in Eger as well! Star's of Eger Weekend, Feszt!Eger, Street musicians festival, Bull's Blood Wine Celebration, just to mention a few great ones. In Eger it is hard to get bored. The small town's scenery and the big city's program variety is very charmingly mixed in Eger. The cultural life is coloured with several theaters, cinemas and exhibition halls. Plan your trip and programs in advance. If you come only for a few days in Eger, do not have to neglect sports. What is more, in the nice innercity it may feel even better to run, swim or play street-basketball.